You never know when you need to translate text fast. You may be travelling and you receive an urgent e-mail in French that you can't understand. Since you're not in front of your computer where you have Systran's French translation software installed, how can you convert the text from English to French so you can decipher the important message that was sent to you? Now you have the Systran Mobile Translator that you can use directly from your iPhone, iPod and iPad. This fantastic application helps you translate text between English and French in just a few seconds, no matter where you are: in an airport, on a bus, in a restaurant or somewhere else inside or outside your country of residence. You don’t even need Internet connection to run the Mobile Translator because once you have it installed on your mobile device it does not need to connect to the Internet in order to work. The Systran Mobile Translator is the perfect solution for travelers or busy people that are always on-the-go and need a translation tool with them all the time. This great application allows you to translate anything from conversations, e-mails to any type of text and even web pages! 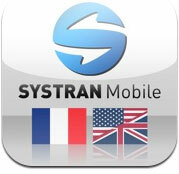 With the mobile application from Systran you can easily communicate in English or French no matter where you are. Imagine you are in France at a restaurant and want to order lunch but the waiter does not understand English. You simply run the Mobile translator and translate in real-time what it is that you’d like to order. With the future speech-to-speech translation technology that Systran is developing, you won’t even need to learn how to speak French because the software will do everything for you. You will only need to speak into the microphone of your mobile device and the software will translate to the language of your choice and then vocalize the translated text to your interlocutor. Find out more about the speech translator that Systran is planning to develop soon. The Systran Mobile Translator currently translates text from French to English and English to French, but it will soon be available for other foreign languages as well, such as Spanish, French, German, Dutch, Portuguese, and Italian. Highlight "not found words" to detect and correct typos and names. Get in touch with us to see how you can get the Systran Mobile Translator and start translating text anytime and anywhere. IPhone Translates as You Type IPAD gives you the same features with a larger format. To download SYSTRAN Software’s SYSTRAN Mobile Translator …, you need to have iTunes. Call us for details. Looking to Translate Full Documents? If you need to translate full documents, including email, Word, Excel or Powerpoint, check out our award winning translation software. Excellent for business travellers, no internet connection required, translate completely offline. Click the 'get started ' button below to see our full line of products.